Pain originating in the sacroiliac joint (SIJ) is increasingly recognized as a common and significant source of low back pain (LBP), representing a debilitating condition with a great cost to society . While the sources and etiology of LBP are often indeterminate and controversial, it has been shown that degenerative SIJ pain may account for as much as 15-30% of patients with axial LBP [2-5]. While conservative measures may provide some relief, fusion of the SIJ is indicated when nonoperative care has failed to provide persistent improvement. In the past decade, minimally invasive (MI) SIJ fusion techniques have become the preferred intervention, having shown superior outcomes to both open SIJ fusion and nonoperative care [6-8]. With the increasing recognition of SIJ disease, MI SIJ fusion systems have proliferated [9-13]. Studies of these systems have shown promising clinical and economic value [12, 14, 15]. While the goal of MI SIJ fusion surgery is to promote fusion leading to long-term pain relief, radiographic fusion rates are not often nor well reported. Few studies report fusion outcomes, but those that do vary from 25%-90% of patients at varying time points of 6 months to 5 years for different technologies [12, 14, 16-18]. Within these studies various imaging modalities are used and only some utilize independent radiographic reviewers. The variability in radiographic fusion assessment among studies of MI SIJ fusion does not provide conclusive demonstration of the rate and timing of the development of arthrodesis with these technologies. An MI SIJ fusion system has been developed that incorporates decortication, bone grafting and fixation with threaded implants. The combination of decortication, graft placement and fixation with threaded implants is postulated to promote fusion of the SIJ more often and earlier than previously reported by other systems. This study prospectively assessed radiographic fusion status and improvement in low back pain at 12 and 24 months for patients treated with MI SIJ fusion including decortication and bone grafting (clinicaltrials.gov identifier NCT02425631). Nineteen patients at three centers (Mayo Clinic, Rochester, MN; Cedar Valley Medical Specialists, Waterloo, IA; Northern Arizona Orthopaedics, Flagstaff, AZ) were enrolled in this study. All patients who had undergone an MI SIJ fusion procedure with decortication, bone grafting and threaded implant fixation within the previous 12 months were recruited for the study. There were no exclusion criteria, as all patients, regardless of their medical history, were deemed appropriate. Willing participants provided informed consent and agreed to comply with study procedures, including CT scans at 12 and 24 months postoperatively. The study protocol was approved by each investigational site’s IRB. The sacroiliac joint fusion system utilized in this study (SImmetry Sacroiliac Joint Fusion System, Zyga Technology, Minnetonka, MN) has been described previously [10, 11]. Briefly, the system uses a proprietary decortication instrument to prepare approximately 5cm2 of the ilial and sacral bone surfaces, removing cartilage and allowing placement of approximately 5cc of bone graft. A 12.5 mm threaded implant is placed through the prepared fusion bed (primary device), and an optional, secondary 6.5mm threaded implant provides additional mechanical stability during the fusion process if the surgeon considers additional fixation appropriate based upon patient anatomical and available bone stock considerations. The system is illustrated in Fig. (1). Patients are placed prone on a radiolucent flat top table. Chest bolsters are placed to elevate the pelvis and assist with image acquisition. The posterior buttocks and proximal thighs are prepped into the sterile field. Pelvic inlet and outlet views are utilized to obtain an appropriate starting point into the preoperatively templated trajectory based on sacral anatomy. Most often, this trajectory resided in the S1 vertebral body. Once this starting point is verified on both pelvic views with fluoroscopy, a 3.2mm guide pin is placed across the ilium and across the SI joint. Dilators are used and a working portal inserted. A 9mm drill is then used to drill across the ilium and across, but not through the SI joint. The working cannula is then malleted into the ilium, over the drill, to maintain the correct trajectory across the SI joint. The drill is then removed and autograft collected from the drill flutes for later bone grafting into the fusion zone. A flat ended scraper is utilized to remove cartilage from the sacral side of the SI joint. Three sequential, flexible, deployable decorticating curettes are then used to prepare the joint surfaces for arthrodesis. Each of these decorticators is progressively more aggressive. Osteochondral debris is irrigated and removed from the fusion area and autologous bone graft from the drill flutes as well as, optionally, a bone graft extender such as demineralized bone matrix (DBM) (e.g., Grafton, Medtronic, Minneapolis, MN) are then applied through the working cannula. The guide pin is reinserted into the center position of the working portal and placed into the appropriate trajectory in the sacrum. Minor corrections can be made at this point to ensure safe passage into the sacrum. The 9mm drill is used again to drill across the SI joint into the sacrum. The length is measured and the primary implant is placed across SI joint. The implant is verified to be fully seated by using an anterior-posterior fluoroscopic view with 20 to 30 degrees of ‘rollback’ allowing the surgeon to visualize the outer table of the ilium. Fig. (1). SImmetry System. Panel A illustrates the decorticator instrument preparing the graft bed (arrow); the decorticated region is then packed with approximately 5cc of graft material (B; arrow). Final implant construct (C), showing a 12.5mm cannulated implant (inferior) with surrounding decorticated area and graft (arrow) and 6.5mm anti-rotation implant (superior). A 6.5mm secondary, anti-rotation implant is then applied using a cannulated system in most cases. This screw is placed using the same fluoroscopic views and is inserted either directly cranial or caudal to the main implant based on preoperative planning and sacral morphology. No joint decortication is used in the application of this anti-rotation screw. The single incision is copiously irrigated and local anesthetic applied followed by a layered soft-tissue closure. Typical post-operative instructions include 2-3 weeks of partial weight bearing followed by auto-advancing patients as tolerated. No deep vein thrombosis prophylaxis was utilized. Axial CT images with coronal, paracoronal and sagittal reconstructions were obtained 12 and 24 months postoperatively. All unformatted digital images were transferred to an independent radiographic core laboratory (Medical Metrics Inc., Houston, TX) for analysis. Qualitative and quantitative assessments were performed by two independent radiographic evaluators and an adjudicator. The evaluators were blinded to each other’s assessments, and disagreement between the two primary evaluators were resolved by the adjudicator. All evaluators were board-certified, fellowship-trained, practicing musculoskeletal radiologists with no financial interest in the study sponsor. The radiographic evaluators were trained on the schedule of assessments, classification system for recording each assessment, the radiographic features of the device and its design. They did not have access to clinical outcomes data and the same evaluators were assigned to the study for its duration. The radiographic fusion definitions are described in Table 1. In addition to fusion status, the core laboratory determined the location of fusion and proximity to implanted devices. The radiographic core laboratory has determined that for these techniques of assessment of radiographic SIJ fusion, Gwet’s AC1 chance-corrected agreement coefficient between the two primary reviewers was 0.67 for bridging relative to anatomy, 0.67 for bridging relative to the primary device, and 0.63 for bridging relative to the secondary device . Using the Landis and Koch criteria for judging kappa statistics, the agreement would be considered substantial . Table 1. Radiographic fusion assessment. Ind - Indeterminate A reliable determination cannot be made from the available imaging due to technical factors, sub-optimal image quality, obscured anatomy, obstructed view or other imaging artifacts. UA - Unable to assess The relevant images are missing or unavailable for review, or the relevant anatomy is not visible in the field of view. Low back pain (LBP) was assessed preoperatively and postoperatively at 12 and 24 months with a 0-10 numerical pain scale (NPS). Overall patient satisfaction with the implant system and smoking status were collected at both the 12 and 24 month visits. Any untoward medical occurrence that comprised a negative change from baseline was considered an adverse event (AE), and required to be promptly reported to the sponsor. AE assessment included classification of the AE as serious or non-serious, review of device-related AEs and any additional procedures performed or required since the procedure. A minimal clinically important difference (MCID) was defined as an NPS improvement of at least 2/10 . Changes in low back pain were assessed using 1-tailed Student’s t-test. Paired t-tests were used for same-subject data. A significance level of p≤0.05 was used. Confidence intervals for parametric statistics were calculated assuming a t-distribution. Binomial confidence intervals were calculated using the normal approximation method. Nineteen patients who had undergone MI SIJ fusion with decortication and bone grafting were enrolled at three centers. All nineteen subjects were available for 12 month follow-up. One patient withdrew from the study after the 12 month visit; the remaining 18 patients were available for the 24 month follow-up. Patient demographics are summarized in Table 2. Table 2. Summary of patient demographics. All surgical procedures were successfully completed as intended, with no intraoperative complications reported. All procedures were performed unilaterally. Fourteen (74%) patients had both primary and secondary threaded fixation implants; five (26%) had only a single threaded fixation implant. The number of implants utilized was at the surgeons discretion based upon patient anatomy and perceived safety issues with placing another implant. There were no statistically significant differences in the outcomes in patients treated with 1 or 2 implants. It is the authors opinion that a single implant placed with compression can provide significant stability given the tongue-in-groove orientation of most sacral ala. The bone grafting procedure was uniform across the three investigators, and consisted of approximately 3-5 cc of autograft from iliac crest drilling as part of the procedure as well as 5cc of demineralized bone matrix. Additional surgical procedure data are summarized in Table 3. Table 3. Surgical procedure data. Fusion status, as assessed and adjudicated by the independent radiographic core laboratory, is summarized in (Fig. 2 and Table 4). Examples of CT images assessed as bridging bone with solid fusion, bridging bone with possible fusion and not fused are shown in Fig. (3). Fifteen of 19 (79%) were assessed to have demonstrated radiographic fusion at 12 months follow-up, and 17/18 (94%) at 24 months follow-up. 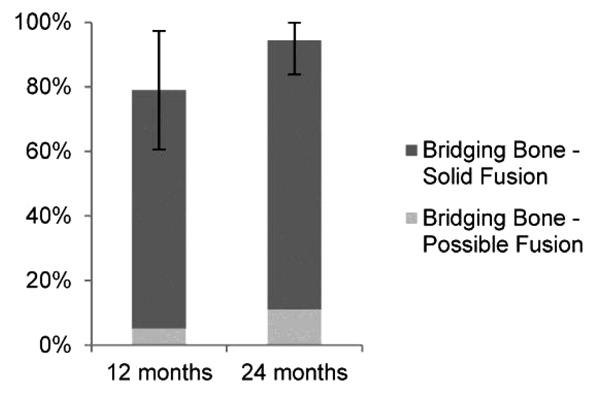 Of patients exhibiting bridging bone, 14/15 (93%) at 12 months and 15/17 (88%) at 24 months were assessed as having solid fusion. The fusion location was found to be within the decorticated region around the primary implant in 87% and 88% of subjects exhibiting bridging bone (13/15 at 12 months; 15/17 at 24 months). Fig. (2). Radiographic fusion status (error bars represent 95% CI). Table 4. Radiographic fusion status. Fig. (3). CT images assessed as bridging bone with solid fusion (A), bridging bone with possible fusion (B) and not fused (C). Of the four patients that had not yet demonstrated fusion at 12 months follow-up, by 24 months one had demonstrated solid fusion, one demonstrated possible fusion, one was not fused, and one was lost to follow-up. Fusion status was compared to baseline characteristic, and was found to have no association with smoking status, gender, age or BMI. LBP results are summarized in Fig. 4 and Table 5. 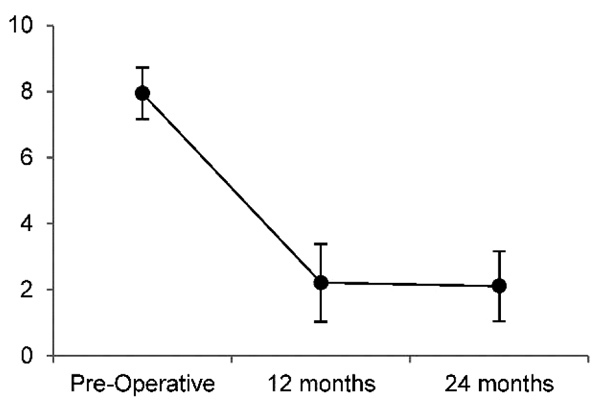 Mean preoperative LBP was 7.9/10, and reduced to 2.2/10 12 months postoperatively and 2.1/10 24 months postoperatively, representing a 72% and 73% reduction in LBP, respectively. The reduction in LBP were significant (p<0.01) at both 12 and 24 months, with large effect sizes of -3.5 and -2.9, respectively. At 12 months, 19/19 (100%) of patients met the MCID of ≥2/10 improvement on the NPS; at 24 months follow-up 17/18 (94%) met the MCID. Fig. (4). Low Back Pain (numerical pain scale, 0-10; error bars represent 95% CI). Table 5. Low back pain results. There were no procedural complications, nor were any device or procedure-related serious adverse events (SAEs) reported at any time point. At 12 and 24 months respectively, four (21%) and two (11%) patients had experienced device-related adverse events, however as mentioned previously, none of these were classified as SAEs. At 24 months, 17/18 (94%) were satisfied with their result, and 16/18 (89%) would recommend the surgery to another. In the current study, following principles of orthopedic fusion surgery, radiographically proven arthrodesis was achieved in over 90% of our cohort; 79% and 94% of patients demonstrated bridging bone 12 and 24 months, respectively, after MI SIJ fusion surgery that included decortication, bone graft and threaded fixation. Patients reported clinically significant and durable improvements in pain, with 75% reduction at 24 months follow-up, comparable to the improvements seen in other reports of MI SIJ fusion and superior to reported results for nonoperative care [14, 17, 22]. We feel our results are the product of the accepted orthopedic principles of arthrodesis, including decortication, autograft and secure fixation. Decortication exposes subcortical blood and marrow, which provide vascularization, mesenchymal stem cells, osteogenic and inflammatory factors that promote the bone growth necessary for fusion [23, 24]. Tissue differentiation of skeletal stem cells is determined by both the loading environment and vascularity [25, 26]. Insufficient fixation resulting in excessive residual joint motion may create local tensile loads in the remodeling tissue. This mechanical environment would result in stem cell differentiation into fibrous connective tissue. Conversely, even with proper fixation, without the vascularity provided by decortication, local hydrostatic pressure would induce tissue differentiation into cartilage [25, 26]. In addition to being a generally accepted orthopedic principle, this hypothesis is supported by recent work by Spain et al where SIJ screw fixation without decortication or grafting resulted in higher reoperation rates . Similarly, Duhon et al reported bone adherent or adjacent to >30% of the surface area of >90% of triangular titanium implants at 12 months follow-up; however bridging bone across the SIJ representing true fusion formation was only seen in 25% of cases and 48.3% of patients in the same study continuing to take opioids at 24 months follow-up [12, 22]. In these cases, it would seem that mechanical fixation was provided without the vascular and biological environment necessary for a true arthrodesis. In the present study, 88% of fusions at 24 months were through the decorticated region, supporting this mechanism of action. It is notable that fusion rates with MI SIJ fusion systems are not well reported in the literature. This is stark contrast to other studies in the spine regarding lumbar and lumbosacral fusions where radiographic arthrodesis is actively sought and documented to help demonstrate success [28, 29]. In a systematic review of MI SIJ fusion by Heiney et al, only two of 18 included studies reported fusion rates . While radiographic fusion outcomes of MI SIJ procedures are rarely and inconsistently reported, the results of this study compare favorably to the fusion rates reported for various MI SIJ fusion technologies, as summarized in Fig. 5 and Table 6. 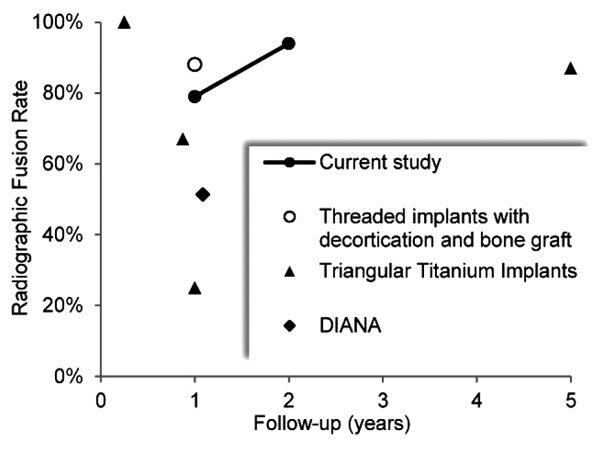 At approximately 1 year postoperatively, reported fusion rates for triangular titanium implants ranged from 25% to 67%, increasing to 87% at 5 years, while a 51.4% fusion rate was reported for the distraction interference arthrodesis neurovascular anticipating (DIANA) system [12, 14, 18, 31]. The high fusion rate reported by Rudolf et al at 5 years follow-up likely reflects the longer process of auto-arthrodesis resulting from joint immobilization, rather than the fusion mass that develops with decortication and bone graft. Table 6. Current and reported bridging bone fusion rates for MI SIJ fusion. 24 months CT imaging; independently assessed and adjudicated for bridging bone. Threaded implant fixation with decortication and graft placement. Kube et al  20 88% 12 months Thin slice (<2mm) CT imaging assessment of bony bridging across the SIJ and absence of lucency. Threaded implant fixation with decortication and graft placement. Duhon et al  159 25% 12 months CT imaging assessment of bridging bone either adjacent or distant to triangular titanium implants. Rudolf et al  15 87% 5 years CT imaging assessment of evidence of osseous bridging across the SIJ. Triangular titanium implants. Treon et al  37 51% 13 months CT assessment of fusion status after distraction interference arthrodesis neurovascular anticipating (DIANA) posterior MI SIJ fusion. (“initial fusion”) 3 months CT imaging demonstrated “initial fusion” at 3 months with triangular titanium implants. Schroeder et al  6 67% 4-15 months Successful fusion defined as bridging bone across the SIJ in an axial or coronal CT scan or on two x-ray views. Triangular titanium implants. Fig. (5). Comparison of current and reported radiographic fusion results for MI SIJ fusion [12-14, 16-18, 31]. Weaknesses in our study include the small patient sample size. Importantly, it was not powered to detect associations between radiographic fusion status and clinical outcomes and instead, the primary outcome assessment was radiographic fusion. The paucity of reported fusion rates vs. clinical outcomes demands further investigation. Larger prospective, comparative studies should enable predictive association of preoperative variables, fusion status and implant system characteristics to clinical outcomes. Strengths of our study include the use of independent, non-biased musculoskeletal radiologists as reviewers. Previous studies have used the authors and industry consultants to provide radiographic fusion data which can clearly bias the interpretation of radiographic fusion. Our study included both radiographic assessments and clinical outcomes up to 24 months. These data show continued improvements with both metrics indicating that improvements in patient outcomes can be expected to continue beyond the one-year mark. In summary, the clinical improvements seen with MI SIJ fusion systems, particularly when compared to nonoperative care, are clearly evident with this and other studies and cannot be disputed. The radiographic fusion results seen in this series are further encouraging that consistently durable results can be achieved in appropriately selected patients. Patients treated with MI SIJ fusion utilizing decortication, bone grafting, and implantation of threaded implants demonstrated significant improvement in low back pain. Fusion rates at 24 months as assessed in CT imaging, including evidence of bridging bone in 94% of patients and solid fusion extending from the ilium to sacrum in 83% demonstrate promise for this system, which utilizes the established orthopedic principles of decortication, bone grafting and threaded fixation to achieve arthrodesis. Further, study is warranted to demonstrate comparative fusion rates for different implant systems and predictive correlation to clinical outcomes. The study sponsor (Zyga Technology, Inc.) provided research grants to authors’ institutions to collect and submit data. LF is a consultant to the study sponsor. The study protocol was approved by each investigational site’s IRB. The patients provided informed consent and agreed to comply with study procedures, including CT scans at 12 and 24 months postoperatively. Andersson GB. Epidemiological features of chronic low-back pain. Lancet 1999; 354(9178): 581-5. Sembrano JN, Polly DW Jr. How often is low back pain not coming from the back? Spine 2009; 34(1): E27-32. Cohen SP. Sacroiliac joint pain: A comprehensive review of anatomy, diagnosis, and treatment. Anesth Analg 2005; 101(5): 1440-53. Maigne JY, Planchon CA. Sacroiliac joint pain after lumbar fusion. A study with anesthetic blocks. Eur Spine J 2005; 14(7): 654-8. Schwarzer AC, Aprill CN, Bogduk N. The sacroiliac joint in chronic low back pain. Spine 1995; 20(1): 31-7. Smith AG, Capobianco R, Cher D, et al. Open versus minimally invasive sacroiliac joint fusion: A multi-center comparison of perioperative measures and clinical outcomes. Ann Surg Innov Res 2013; 7(1): 14. Whang P, Cher D, Polly D, et al. Sacroiliac Joint Fusion Using Triangular Titanium Implants vs. Non-Surgical Management: Six-Month Outcomes from a Prospective Randomized Controlled Trial. Int J Spine Surg 2015; 9: 6. Polly DW, Cher DJ, Wine KD, et al. Randomized controlled trial of minimally invasive sacroiliac joint fusion using triangular titanium implants vs nonsurgical management for sacroiliac joint dysfunction: 12-month outcomes. Neurosurgery 2015; 77(5): 674-90. Endres S, Ludwig E. Outcome of distraction interference arthrodesis of the sacroiliac joint for sacroiliac arthritis. Indian J Orthop 2013; 47(5): 437-42. Miller LE, Block JE. Minimally invasive arthrodesis for chronic sacroiliac joint dysfunction using the SImmetry SI Joint Fusion system. Med Devices (Auckl) 2014; 7: 125-30. Beaubien B, Salib RM, Fielding LC, Block JE. SImmetry sacroiliac joint fusion system with sImmetry decorticator. Surgical Science 2015; 06(07): 282-91. Duhon BS, Bitan F, Lockstadt H, Kovalsky D, Cher D, Hillen T. Triangular titanium implants for minimally invasive sacroiliac joint fusion: 2-Year follow-up from a prospective multicenter trial. Int J Spine Surg 2016; 10: 13. Gaetani P, Miotti D, Risso A, et al. 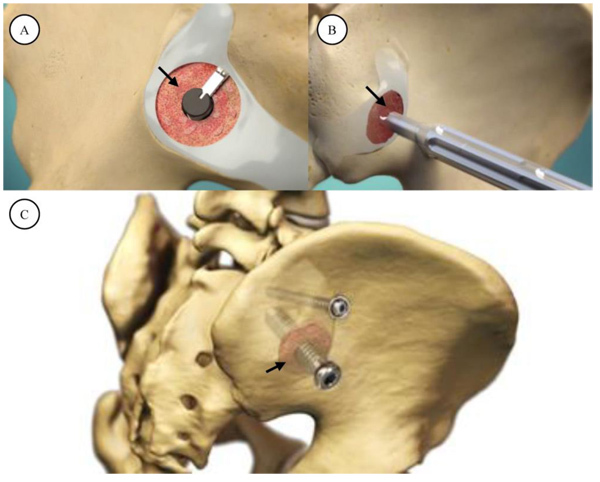 Percutaneous arthrodesis of sacro-iliac joint: A pilot study. J Neurosurg Sci 2013; 57(4): 297-301. Rudolf L, Capobianco R. Five-year clinical and radiographic outcomes after minimally invasive sacroiliac joint fusion using triangular implants. Open Orthop J 2014; 8: 375-83. Cher DJ, Frasco MA, Arnold RJ, Polly DW. Cost-effectiveness of minimally invasive sacroiliac joint fusion. Clinicoecon Outcomes Res 2015; 8: 1-14. Kube RA, Ed. Ed. Sacro-Iliac fusion rates using a novel MIS system. 15th Annual Meeting of the International Society for the Advancement of Spine Surgery. 2015 April 15-17, 2015; San Diego, CA. Kube RA, Muir JM. Sacroiliac joint fusion: One year clinical and radiographic results following minimally invasive sacroiliac joint fusion surgery. Open Orthop J 2016; 10: 679-89. Treon K, Clement AT, Craig NJ. Fusion rates following distraction interference arthrodesis of the sacroiliac joint. A retrospective study of post-operative computerized tomography (CT) scans. Spine J 16(4): S77. Hipp JA, Abbasi HR. The assessment of fusion following sacroiliac joint fusion surgery 2017. Maughan EF, Lewis JS. Outcome measures in chronic low back pain. Eur Spine J 2010; 19(9): 1484-94. Polly DW, Swofford J, Whang PG, et al. Two-Year outcomes from a randomized controlled trial of minimally invasive sacroiliac joint fusion vs. non-surgical management for sacroiliac joint dysfunction. Int J Spine Surg 2016; 10: 28. Friedenstein AJ, Petrakova KV, Kurolesova AI, Frolova GP. Heterotopic of bone marrow. Analysis of precursor cells for osteogenic and hematopoietic tissues. Transplantation 1968; 6(2): 230-47. Muschler GF, Lane JM, Dawson eg. The Biology of Spinal Fusion.Spinal Fusion: Science and Technique 1990; 9-21. Carter DR. Mechanical loading history and skeletal biology. J Biomech 1987; 20(11-12): 1095-109. Carter DR, Beaupré GS, Giori NJ, Helms JA. Mechanobiology of skeletal regeneration. Clin Orthop Relat Res 1998; (355): (Suppl.)S41-55. Spain K, Holt T. Surgical revision after sacroiliac joint fixation or fusion. Int J Spine Surg 2017; 11(1): 5. Isaacs RE, Sembrano JN, Tohmeh AG. Two-Year comparative outcomes of MIS lateral and MIS transforaminal interbody fusion in the treatment of degenerative spondylolisthesis: Part II: Radiographic findings. Spine 2016; 41(Suppl. 8): S133-44. Hurlbert RJ, Alexander D, Bailey S, et al. rhBMP-2 for posterolateral instrumented lumbar fusion: A multicenter prospective randomized controlled trial. Spine 2013; 38(25): 2139-48. Heiney J, Capobianco R, Cher D. A systematic review of minimally invasive sacroiliac joint fusion utilizing a lateral transarticular technique. Int J Spine Surg 2015; 9: 40. Schroeder JE, Cunningham ME, Ross T, Boachie-Adjei O. Early results of sacro-iliac joint fixation following long fusion to the sacrum in adult spine deformity. HSS journal : the musculoskeletal journal of Hospital for Special Surgery 2014.